However the reality was that there were few students coming into the office and most of them were there simply to fill out forms and ask a few questions about the program. None of them were there to really learn about the US and what life might be like there. So I basically worked in the office a few hours a week and did other projects for the office helping them with their marketing material and ideas, visiting new programs they wanted to get off the ground, and occasionally talking to a student for about 10 minutes (this really only happened twice in the whole month). Like any volunteering – it’s good to be able to adapt to a situation as they never seems to be what you expect. Lebanon’s Conversation Partner program is in it’s infancy (each country’s program is different) and they are working at building out more opportunities that will be quite amazing and fulfilling. I was able to go visit one of the pending Partner programs with the office manager. We traveled over the mountains, out of Beirut, to town of Taanayel, which is a short drive to the border of Syria. We arrived at Arcenciel (meaning rainbow in French) – a community based NGO organization helping the disabled, poverty stricken, and locals in their community. The director of the organization met with us and gave us a personal tour of the MANY programs that Arcenciel runs. What looked rather boring and run down on the outside held many surprises inside! First she took us through the wheelchair manufacturing center. 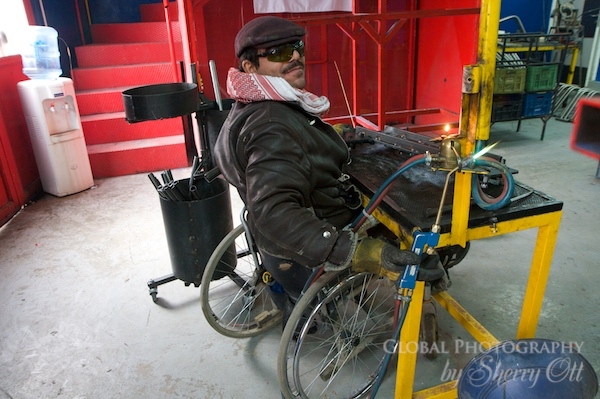 The coolest thing is that every single wheelchair is really made/welded by hand by people who are disabled in the community. As we walked into the welding room we were greeted with warm hellos in French and Arabic – there was little English spoken here, but a smile was all I needed. They make about 3,000 chairs a year with their 19 employees. The organization not only supplies chairs to people in need, but it also provides disability education, beds, and other products for the disabled throughout Lebanon. She continued to lead us through the many other projects Arcenciel was involved in ranging from clothing drives, fair trade agriculture and farming techniques, medical services (dentistry, gynecology, psychology from local volunteer doctors), computer classes for the locals, “school after school” programs (tutoring), language classes, educating people on abuse, helping those who are abused, providing nursery preschool for healthy and disabled children, and after school sports and workshops for local kids. This is all very important within the community because Taanayel is not a big nor wealthy town. It’s rather run down and really nothing like Beirut; it’s a functional, dusty little town with a lot of bus traffic from Syria. What do all of these programs mean to Conversation Partner in Lebanon? It means there are ample opportunities to really get involved and help people while living in a smaller community; a community which will welcome you with open arms. There are opportunities to not only tutor in English to the wheelchair makers, children, and adults of the various programs. But there are other opportunities to be involved in teaching computer skills, caring for children, work on helping with marketing and branding their agricultural products, or helping organize physical education and events with the after school programs. I love the fact that there will be opportunities to volunteer outside of ESL for career breakers; something that really can put a career breakers wide variety of skills to use! One of my favorite things about the organization is its commitment to bringing diverse people together. 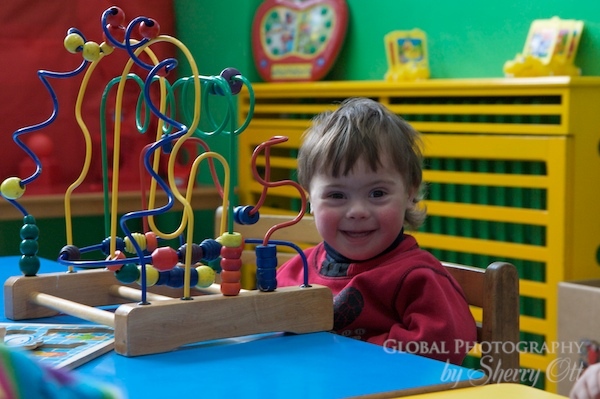 They are committed to bringing the disabled and healthy children together in the nursery and preschool so that they can see how to live and play together; really teaching that there is no reason to be separated. This not only teaches the kids, but more importantly it teaches the parents and community to accept the ‘mixing’ of children. There is also lodging at this organization so future volunteers would be able to stay at Arcenciel, work there, and really integrate into the community; which I believe is the best kind of volunteering there is. As noted, it’s close to Syria – so a trip to Damascus is possible, and you can easily catch local buses into Beirut only a 90 min ride away. There are also hiking opportunities around the nearby mountains as well as plenty of nearby ruins to visit. I really was impressed with every aspect of this NGO organization. 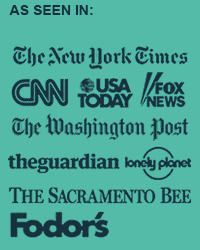 Plus – they have many other programs throughout the country. So my overall experience in the Conversation Partner program in Lebanon was a bit disappointing as I would have liked to do more with tutoring or volunteer my time in some way, but I can see there are some great things in store as they continue to increase their offerings in Lebanon outside of Beirut. My best advice is that if you want to go to Lebanon and volunteer some of your time then make sure you check with the office and see what types of opportunities really do exist for their conversation partner program. If you want to go to Lebanon and volunteer a lot of your time – then you might want to look elsewhere. Please remember that the GeoVisions volunteer opportunities are really about a mixture of cultural exchange and volunteering; the opportunities leave you a lot of free time to travel and explore a country. Have low expectations – as they are seldom what you expect based on your western standards or what you are led to believe based on marketing alone. Do your research – ask questions and don’t take what the website says at face value. Ask for references from former volunteers and follow up with them personally. Be flexible and open to change – you may get to an opportunity and realize that it isn’t what you thought you were going to do. International volunteering often requires you to pivot a little. To learn more about Arcenciel check out their website – sorry, it’s only in French! 5 Comments on "Volunteering Reality: Lebanon"
I had no idea about the program in your post. They do sound like a great way to help local communities! It is too bad that your expectations were a little off but it sounds like the trip ended up be very worthwhile and maybe even ended up surpassing your expectations! Flexibility is the key. Thanks Debbie – glad you like the post. I had a wonderful time in Lebanon despite the current state of the program. They really do have some great stuff coming up so I was happy to share that plans! Plus – GeoVisions were really wonderful about the whole thing and I made a ton of friends through my host family there and the people I worked with in the office! Want to do something meaningful in the Lebanon community? Whether you’re looking to raise funds, raise awareness, or just raise spirits, you’ll find there are endless opportunities to get involved in causes that matter to you right here in Lebanon and the surrounding towns.